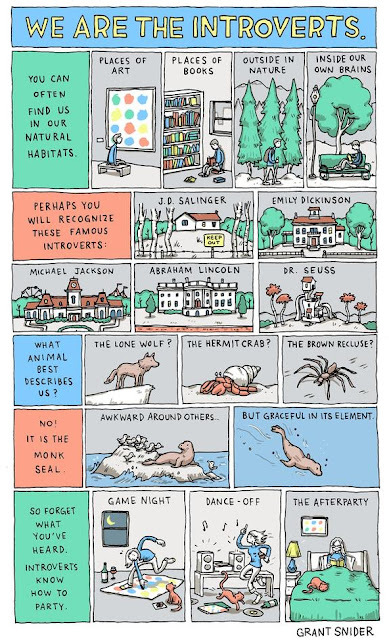 le beau sent me this comic by grant snider last night. love it! where do you fall on the introvert/extrovert scale? while it took me years to figure out why i was so "different," i now embrace it with glee. i mean, after all, it helps me feel more literary (emily dickinson) and amazing (abraham lincoln)! Thank you for this. As an introvert myself, growing up I often had to fight feelings there was something 'wrong' with me. I love this resource and plan to check out her book. For many years I thought there was something wrong with me, people thought I was weird and told me so. It has only been in the last 2 years I have learned about and embraced my introversion; working with it instead of against it has helped me immensely! I have had fun researching it too. I am also an introvert! Susan Cain's book was fabulous, not just for understanding ourselves, but she does a brilliant job of not making extroverts out to be loud baffoons, which many other introvert-centric outlets do. Rather than focus on Us V. Them, she strikes the balance between the two, highlighting why the world needs both personality types. Harmony... that's what is needed. I am so proud to be an introvert! I loved reading Susan Cain's book and watching her TED video, and now I feel I can embrace my quietness and my quiet way of doing things. When I was young I was made to feel there was something wrong with me, and that I was shy. However now I know I am just an introvert and there is nothing wrong with that. I loved the poster picture, it put a big smile on my face. LOVE THIS!! What a great talk! Am definitely going to look for her book.